The reported demise of Amateur Radio is greatly exaggerated. The hobby is alive and well, thriving and adapting in a world of technological advances. With a growing air of internationalism and with most people in reach of their cellphone or other device, Amateur (ham) Radio continues to thrive. Agencies such as hospitals and other emergency responders get licensed to provide a valuable back up to congested communications grids. Amateur Radio Operators volunteer their time and services to communities. Popular activities such as Field Day and hill-topping attract the more adventurous. There are even extreme operating such as groups forming expeditions to remote islands and operating from there. With the dropping of the requirement to learn Morse Code, there has been a major influx of new operators. You can always find someone to talk to on the air. Amateur Radio is a hobby that spans generations and continents. If you like talking to new people and making new friends around the world, then Amateur Radio is for you. But wait! That is not all there is. You can perform public service by providing communications at events such as races and parades. You can experiment with computer interfaces and work digital modes. You can go to the top of a mountain and see how many people you can talk to. You can build your own radios and antennas. You can even talk to the International Space Station or bounce a signal off the moon or use a satellite link to contact other Amateur Operators. You are only limited by your imagination. There are so many things to do in Amateur Radio that there is something for everyone. In this day and age it is easy to dismiss Amateur Radio as an outdated service that has been replaced by cell phones and the internet. That is not the case at all. Consider this: would you think of dialing a number randomly on your phone and being able to carry on a conversation with the person who answers? In some ways that is exactly the way Amateur Radio works. I can call out on one of our allocated bands and get an answer from someone who, though they may be a stranger, is interested in talking to me. I have learned a lot about people and places through radio and have made many friends. I have spoken with doctors, lawyers, dj's, carpenters, reporters ... the list spans the entire spectrum of occupations. It is a great feeling to be tuning across one of the bands and hear a voice with a foreign accent calling for contacts. 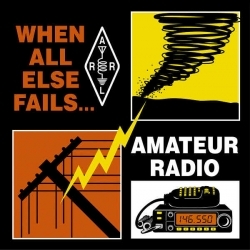 Amateur Radio has a long history of assisting in emergencies and disasters. Amateur operators helped out with communications on 9-11. They provided assistance during hurricane Katrina. The scope of their assistance might seem limited but being able to provide family members with the news that a loved one is ok and safe is very important. When a disaster strikes the cell phones can become useless due to congested service and downed towers. Sometimes Amateur Radio is the only way to convey messages between agencies. The Dept of Homeland Security has recognized the role of Amateur Radio in disaster planning and response. Local Amateur Radio clubs can direct you where to receive training and where to volunteer. Ask me about Ham Radio - I would like to hear from you. I just put up a Double Bazooka Antenna for 17 Meters this past Sunday. It is working great! 40 Meters was good this afternoon. I was in the former novice portion of the band and had a conversation with a gent in Maine and one in Michigan.